Eltronicschool. - This is one of bipolar motor stepper driver circuit schematic for you who want to build your self motor driver for motor stepper. 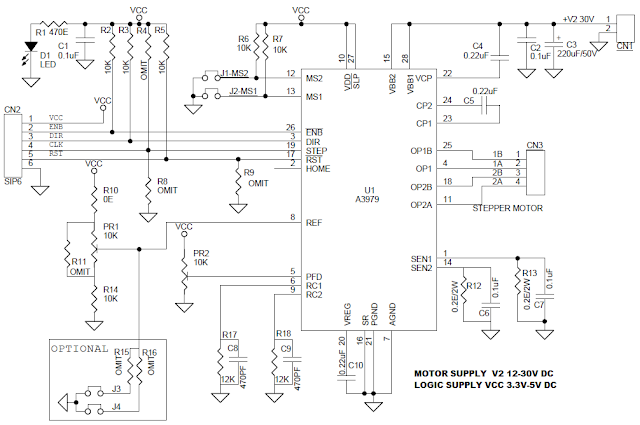 This driver motor stepper named with circuit schematic of 2.5A Bipolar Stepper Motor Driver using A3979 IC like in Figure 1 below. In this time, based on A3979 IC for motor driver IC, we will give you one of electronic circuit schematic of 2.5A Bipolar Stepper Motor Driver using A3979 IC and also component needed and small description about this circuit. Circuit schematic like in Figure 1 above is 2.5A Bipolar Stepper Motor Driver using A3979 IC. Depending Electronics-Lab site describe that the tiny board designed using A3979 IC from ALLEGRO which is complete micro stepping driver with built in translator. The translator is the key to the easy implementation of the A3979. It allows the simple input of one pulse on the STEP pin to drive the motor one micro step, which can be either a full step, half, quarter, or sixteenth, depending on the setting of the MS1 and MS2 logic inputs. There are no phase-sequence tables, high-frequency control lines, or complex interfaces to program. The A3979 interface is an ideal fit for applications where a complex microprocessor is unavailable or is overburdened.